This is the third book I write about in my series about the great works of the past. The Leftist book club had included this book in their mail-outs and included a foreword by one of the curators, qualifying his reasoning for including the book. He seemed to appreciate the first half, expecting it to turn most anyone that read it to feel the need for socialism after reading about the terrible living conditions. However he did want to clarify that had he the chance he would argue with Orwell on certain conclusions that he had come to. Orwell seemed to see Socialists as stuck-up intellectuals (of which he also had attributes of), that the middle class despised the lower class. Hopefully stirring up the need for the coming together to fight against the oppressors. Orwell paints the picture of a horribly depressing lifestyle, of a disgusting living space with horrifying living arrangements, people that are simplistic and filthy, uncaring about their own appearance and environment, and pisspoor jobs that only pay enough with extreme work to keep you just where you’re at, quick to remove you at a moment’s notice, and those that are unemployed stay around the building doing nothing but reading. The Brookers’ dislike all their tenants, waiting for the older ones to die so that they can collect the insurance, complaining about those that spend time there around the house during the day. When an outsider stayed there for one day then told them off and left they couldn’t understand why it was that he had left, unable to recognize the shithole they existed inside of. After an (indeterminate) amount of time, Orwell was too depressed from living there and took a train to get away. While looking outside he watched the sad landscape pass him by, catching the eye of a haggard woman trying to unclog her outside pipes. She had the look of full recognition of how she existed there. 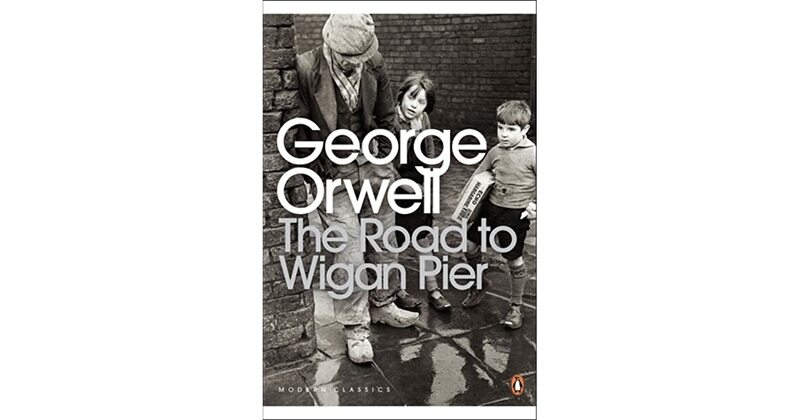 Orwell travels down hundreds of yards down into the underworld that is the coal mines. It is hell. Every aspect is seemingly created to only accommodate 1 thing, bring the coal out. 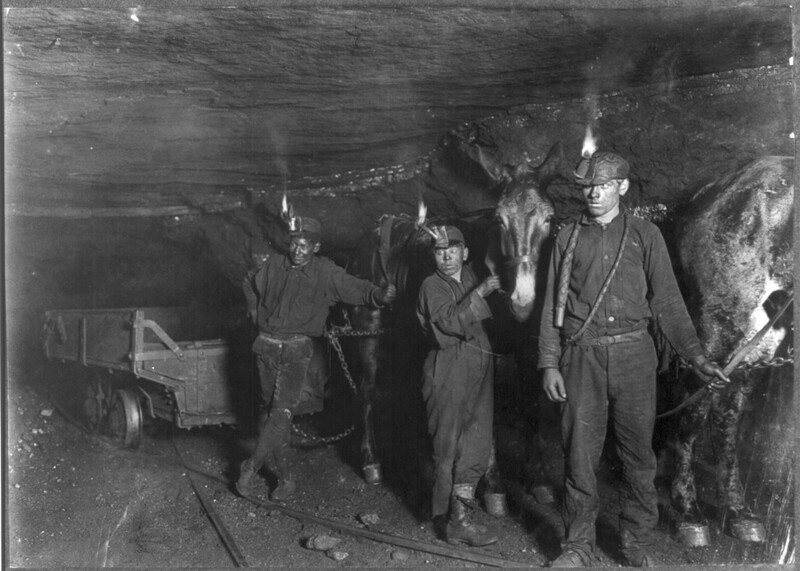 The workers are the greatest men in the world, living and working in the worst conditions imaginable, having to dress down to almost nothing because of the heat in certain mines, and have to constantly walk with a hunched back down long pathways maybe a mile or more long to just get to the vein and finally start work. The men are as fit as can be, they need to be. The black soot stains them especially since they wear next to nothing, and the constant ducking and scraping against the ceiling callouses the vertebrae on their backs. This is a necessary evil in order for the great wonders and comforts of the top-world, a world where recognition for these men is not found and instead maybe despisement for them. No thought is put into the handy coal blocks bought, how much horrible work of shoveling tons upon tons of hard black rock, all while on your knees, was put in just to make things comfortable for the other people, the higher people. Describes just how the lives of miners are, outside of work. Their work hours, despite only being paid for 7.5 hours a day, takes up almost their entire life. Including all the time needed to prepare for work, travel to the location, then crawl the miles to the active vein, then sleeping, the men have maybe 4 hours of time all to themselves, and even that is hampered by anytime spent bathing or eating. And as for bathing, many miners would hardly bother cleaning themselves just because it takes so long, and is fruitless because of the recurring amount of coal dust they work with. Also because of the constant hours, depending on your shift that would wildly throw off your familial relationships. And as for eating you were limited in not having any ‘heavy’ meals as it’d lessen your abilities at work. Also, despite the assumption that Miners are well paid, there are plenty of cuts from off of their paychecks to pay for union dues, insurance, money for widows or injured fellow workers in the mines, use and repair for the company’s tools and lamps, etc. Everything averaged and totalled out you’d be making about 2 pounds a week, or compared to today’s money, $200 a week, and being paid $34 a day. ~$4.50 per hour worked. Even if you were lucky enough to be injured on the job, or disabled permanently from the working conditions. You might be paid a lump sum (500 pounds was what one of Orwell’s roommates was from having his legs crushed), or receive paltry weekly amounts that you had to go out and wait for, not even the benefits of the higher class in cases of being able to easily use and spend their money was the same between them. Is about the housing for the people if Wiggan. All of them seem to be overcrowded and falling apart, many with insect problems, heating issues, not enough beds, long distance to the outhouses, rotting wood, horribles smells, stuck windows, and overall poor (cheap) planning when building the houses. There are those that live in the caravans, rundown buses or canvased smaller grounded vehicles. Much smaller and worse living enviroments for hardly less of a price, sometimes more than the actual housing. So many of the houses were condemned but had to stay active just because no new houses could be built quickly enough. Sometimes the governement would pull you out of you old home you had paid ~6 shillings per week for and force you to move you to the 10 shilling corporate housing. Buildings that the people didn’t care for (either because of just because they’re different) or because of the poor heating and layout of the buildings. Along with these houses were more strict rules about the garden and animals you kept around. Many of these buildings were placed in the worst possible locations for actually being a useful citizen, so far from any bus stop and also a great journey just to stop by a bar and have a bit of social interaction. Is about the unemployed ~third of people in Wiggan and how they spend their time. In particular the specifics of ‘the dole’ (welfare, how much they make with or without a family, which is strictly looked after to make sure no one has a job while still being recompensed for unemployment, even small things like feeding the neighbor’s chickens for them while they’re away. There’s a common aspect of the working class that they’re capable of simply lowering their standards for living, be it in their housing, how much they have to work, their hygiene, their food, but also, it’s interesting, that the standards for a mate are lessened as well, so even men at the bottom of the hierarchy are able to make relationships and start families. The reason it seems is that the equality of the environment makes it so there is no real hierarchy, everyone lives the same, working or unemployed. How the unemployed tend to spend their time, since they have to get out of the wretched house or become stagnate and commit suicide, is to go out to any gathering that has heat. They’ll listen to the worst lectures, watch the cheap movies, go out to libraries to read, meetup at social groups to build furniture for their homes. The more prominent use of their time (and limited money) is spent on gambling, ‘something to live for’ as they call it. It seems that fantasy is a fitting need when your reality is so unpleasant. Is primarily about the diets of the unemployed and the miners. Following the thread from earlier, those that live in a life of struggle would much rather live in comfort in what they eat rather than eating what is necessarily good for them. The working class would spend much of their food-budget on sugar, tobacco, white-bread, and fish and chips instead of staying to a healthier and cheaper dietary-budget. Why not cheaper, as they live in destitute? Because the money that has been assigned to them to cover their meals must all be spend, otherwise there is that risk of not being given that same amount in the future. So in order to continue getting money they must spend all the money that they are given. The backwards diet has spread culturally as well, coming to the point where you’d be hard pressed to find a miner with real teeth, the people see them as just a hassle, false ones being so much easier to deal with. Also their sense of tastse has seemed to adapt to the less refined food, preffering to buy and eat the lower quality tinned food and milk instead of knowing what is healthier or better for them. Another way for the unemployed to spend their time is to wait out for the dirt and coal refuse to be dropped off by train at the top of a hill, which all of the men run by and hop aboard as it goes by at 20mph. Once they’re up there they’d knock the large containers of dirt or shale (and small portions of coal or other fuel) and all of it would spill out down the hill where the man’s wife and children would search through and pick out the worthy pieces to keep for back home. This is of course stealing, but no one really cares as the coal stolen is all from waste that’s not worth going through, unless you’re unemployed, that is. Paints the picture of the landscape of the south. Slag-heaps cover the plains, giving a wavy oceanic imagery to the ground. Along the horizons are a constant barrage of smoke and pollution from the factory smoke-stacks, always visible (unless of course it’s too hazy from their use. It also goes deeply into the viewpoints of both the Northern and Southerners, in respect to each other. The north see the south as the uncivilised lessers that are a bother to have to put up with, while they then see the northerners as stuck-up, grim, bland, jerks. It may be true that the working class are actually living happier lives than the middle class. Maybe by being denied so much they can fully appreciate what it is that they actually have. Plus with a much better body and capabilites than the middle class, the miners are a (at least physically) greater people. Orwell realizes and finds pleasure and dispair of the sometimes perfect familial moments that occur within the houses of the working class, and how if you were to go one hundred years forwards or backwards you would never see the wonderful balance and completeness of the household in this way either before or again. We finally get a proper introduction to who Orwell is, at least in respect to his growing up, as a lower ‘upper-middle-class’ and also the certain beliefs and perspectives the classes had on the lower, higher, and themselves. I find it fascinating how, from his own experience as well as the budget-breakdown from the miner’s spending, every class seems to be putting a lot of effort into pretending to be of higher income than they actually are. The miner’s would be part of a monthly clothes club that would send cheap versions of whatever was in fashion at the moment (something still common for those in lower wealth). The middle-class would also (at least Orwell’s family, as they were making much less than the rest of their friends in their class) take great effort in keeping their status and habits. There’s also a strong level of disgust for those of lesser than the middle-class, best identified by their smell. Of course that attribute is valid for the working-class, as well as their necessity of filth that their jobs entail. And when your defining factor for distaste for another person is so clearly physical, it’s a hard one to refute. The generality that’s false is that the working-class enjoy the filth, I believe it’s just something natural for them through necessity, if they were so sensitive to filth they’d be unable to live in that manor they would have to find another way to live. This is where Orwell starts to quote a far-right reactionary Sainstburry, not exactly in agreement but still with a certain level of respect for being willing to speak out in a way that Saintsburry at least thought was truthfully - especially to do so was essentially cursing his sales to not appeal to the mass-market including the poor. - Sainstburry put forward that the unemployment insurance was hindering the market by not allowing those that didn’t work to suffer harshly for their inaction. Orwell surprisingly has more to criticize fellow Socialists than Sainstburry. Several socialists seem to think that the poor are somehow inherently dirty (though not in so many words) and that the immaterialism of the lower class is an aspiritous virtue to love. This means that -to these socialists- there is no possible way -or reason- for people to change, to try to become better, to become wealthier, to gain more power over themselves and those around them. Those that are poor should remain that way forever, and the middle-class should come join them. Now of course, Orwell notices, the Socialists that seem to love the working-class so much but still have an inherent aspect of the bourgeoisie within themselves that they don’t seem to want to lose. They don’t try to speak as the proletarian, they still have their table-manners, they’re tastes are still for the bourgeoisie culture. The socialists are hypocrites that seemingly do not truly believe what it is that they preach. Orwell explains his introduction to Socialism, seemingly the natural thing to go along with, rebelling against the previous order (and he sees that a similar rebelling was happening to the youth compared to him), and also a commonplace occurrence for the intellectuals of a society to reproach the society that birthed them. But another reason he became more concrete in his stance was while working in Burma as a police officer, a foreign intruder ruling over the people. Here he found himself protecting the english white men from the criminal, black, Burmese men, inside the Burmese territory. He compares the bodily differences between the Burmese and the English. The Burmese are healthier than how the middle-class English live, but Orwell still -non raciall charged- feeling inside him that they are just ‘common’ people. He later goes through the process of shedding that prejudice within him through the journey he took inside this book. As a police officer he hated the oppressive person that he had become, and quickly adopted the idealogy of the oppressed are always correct over the oppressor. Of course, having these secret radical beliefs and sharing them was very different, fior to speak out of turn to someone could ruin your reputation. Discussions of revolutions and the levels of extreme hatred for the system would have to be shamefully kept secret and only with those of similar ilk. So Orwell, putting his money where his mind was, went out to the slums to discover what life was like for them. He created an elaborate backstory and put some effort into disguising himself, so as to not be immediately called out for being there. It took some courage to finally get himself to go into the world he was bred to not go into, but no one really distrusted him, they took him for his word and allowed him into their lives quite readily. Through it he started his own adventure. Goes about looking into what exactly it would mean to destroy the class system and how to go about it. While also scrutinizing as to whether or not either class really wants that to happen. When Orwell was with the working-class there was no real care as to what class he came from, they seemed less interested in the great divide than the bourgeoisie care for it. The cut-throat socialists that demand change that never occur would quickly transition to fascism in order to accomplish what is thought to be best for the people. There are legitimate lower-class people that have upgraded -such as by becoming a popular writer, but are hardly accepted by those around them, thinking that they have gained their new position via means such as appealing to the common people, thus proving you are not respectable, or if you’ve written other works that you have had to pull background strings in order to become successful. The left-wing belief system is very rebelious to anything traditional, even things that the leftist should espouse, they would reject it simply for being long-lasting truths. The leftists say that Bourgeoisie culture is dead (similar to saying white people have no culture). This argument is one that can lead nowhere, as any disagreement would have no affect on their descision, the only action of response is to get angry. If you want to make an enemy of a man, tell him that his ills are incurable. Orwell starts to make his case on the problems with Socialism, told from a proponent’s perspective. The main problem are the socialists themselves. They should have no reason or right to champion the working-class when everything about them differs from their own lifestyle. I think there’s the assumption that the working-class could be converted into becoming just like them, since they essentially have the same ‘values’, but that’s far from being accurate. Socialists are primarily made up of bizarre little people that haven’t performed manual labor possibly in their life, they have a deep desire to see the destruction of the old guard, hoping to be the ones in helping create a new revolution, maybe getting the glory along with it. Lord knows that might be the only way to win a mate for them. Even the working-class that do vote labor party or communist do so not for that reason, but simply to gain higher wages or work safer and better. Only the bourgeoisie well-read socialists really comprehend the inevitable end-point if they get their way. Much like the devout catholics that only read and think constantly about catholicism, they lose that connection with reality, so that the entire world exists only inside their framework of relating to their idealogy. By fully educating themselves on the merits of socialism that further alienates them from their intended targets, (besides their other common eccentricities). Pages 177-178: Another concern, (and a probable reason for few increases in numbers) is the fact that it is hard to write great socialist literature, how could you if everyone lives the same, drama is built around differences?